Hydro Granules are baked clay granules and are suitable for all forms of hydro-culture. With a layer of hydro Granules in the base of a pot, the excess water can be easily drained from the potting soil. This prevents the bottom layer in a pot becoming saturated and potentially causing root problems. We recommend always putting in a thin layer of Hydro Granules before filling a pot with soil. Hydro Granules can also be used for decorative purposes, such as covering flower boxes, etc. 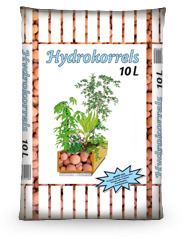 Hydro Granules are available in bags of 10 and 45 litres. Order hydro granules directly through our order form!